These are a clever cross between baked apples and apple pie. Once assembled, they will sit happily in the fridge for 3-4 hours: they’re the perfect prepare-ahead pud. 1. 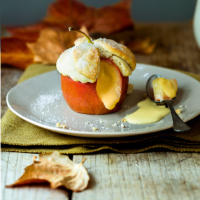 Using a small, sharp knife, hollow out each apple as if you’re preparing a Halloween pumpkin for carving – cut out the core with a roughly 4cm-wide hole, but leave the base of the apple intact, so you’re left with a little ‘bowl’. If preparing ahead, brush the inside of the apple with lemon juice. 2. Whisk the custard with the Calvados, if using, and divide between the apples. 3. On a lightly floured surface, roll out the pastry to about 3mm thick and, using a fluted biscuit cutter, stamp out 4 rounds that are wider than the holes at the top of the apple. Dampen the edges of the pastry with water and stick one onto the top of each apple, keeping the stalk poking out of the top. Add pastry leaves, securing with egg wash. Cover and chill until you’re ready to bake. 4. Preheat the oven to 200˚C, gas mark 6. Whisk the egg white until frothy, then brush onto the pastry. Sprinkle generously with the granulated sugar and sit the apples in a baking dish. Bake for 30-35 minutes, until the pastry is golden, then serve, with more custard, if liked.